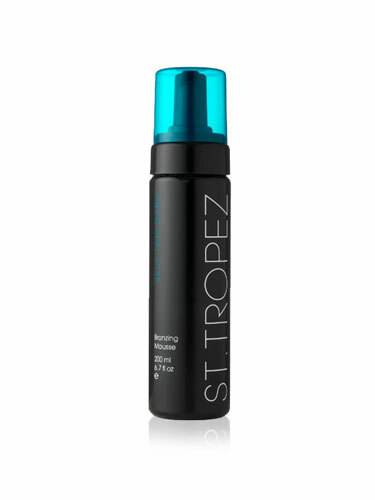 St. Tropez Self Tan Dark Bronzing Mousse, inspired by the best-sellingmousse, is an easy-to-apply advanced formulation that contains innovativemelanin technology that ensures your tan is tailored to your individualskin tone. Exfoliate the day before you tan. Moisturise any dry areas (elbows, knees,ankles, and feet) thoroughly. Protect light areas at eyebrow and hairlinewith extra moisturiser. Pump the velvety mousse into a mitt and smoothfrom top to toe, making sure you're well covered. Wait until touch drybefore dressing. Avoid getting wet or exercise for at least four hours,leave on for eight hours or more for best results. We recommend a patch test is carried out at least 24 hours prior to use.If there are any adverse reactions do not continue to use. Don't apply tobroken, irritated or sensitive skin and stop using if your skin becomesirritated.